Hi Folks. Thursday night's concert is going to be really special. Arturo O'Farrill is a second generation icon of Latin Jazz. He created and leads the Afro-Latin Jazz Orchestra, which is the leading orchestra of it's type in the world. He's coming to Nighttown with a sextet that should prove to be beautiful and exciting. This is a significant concert. We want you, our friends of Nighttown, to be able to hear this artist. So we are pleased to offer you a Two for the Price of One discount. So grab a friend, spouse, or family member and turn them on to some great music. 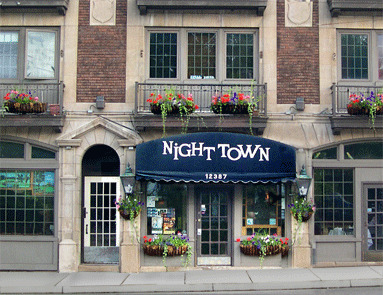 Use the password "Dizzy Gillespie" (one of the fathers of Latin Jazz) when you come to Nighttown for your discount. Use the password "Dizzy Gillespie" when paying for your tickets with the hostess. Bring a friend or family memeber - two people get in for $20. Latin Jazz & Celtic music combined featuring the exciting NYC saxophonist David Bixler & dynamic Latin Jazz pianist Arturo O'Farrill. Featuring: Heather Martin Bixler-violin, Carlos DeRosa-acoustic bass, Vince Cherico-drums, & Roland Guerrero-percussion. Playing music from their new Zoho records release "The Auction Project.